This article is about the weapon. For other uses, see Longbow (disambiguation). A longbow is a type of bow that is tall – roughly equal to the height of the user – allowing the archer a fairly long draw. A longbow is not significantly recurved. Its limbs are relatively narrow so that they are circular or D-shaped in cross section. Flatbows can be just as long; the difference is that, in cross-section, a flatbow has limbs that are approximately rectangular. Longbows for hunting and warfare have been made from many different woods by many cultures; in Europe they date from the Paleolithic, and since the Bronze Age were made mainly from yew, or from wych elm if yew was unavailable. The historical longbow was a self bow made of a single piece of wood, but modern longbows may also be made from modern materials or by gluing different timbers together. Organisations that run archery competitions have set out formal definitions for the various classes; many definitions of the longbow would exclude some medieval examples, materials, and techniques of use. Some archery clubs in the USA classify longbows simply as bows with strings that do not come in contact with their limbs. According to the British Longbow Society, the English longbow is made so that its thickness is at least ​5⁄8 (62.5%) of its width, as in Victorian longbows, and is widest at the handle. This differs from the Medieval longbow, which had a thickness between 33% and 75% of the width. Also, the Victorian longbow does not bend throughout the entire length, as does the medieval longbow. The earliest known example of a longbow was found in 1991 in the Ötztal Alps with a natural mummy known as Ötzi. His bow was made from yew and was 1.82 metres (72 in) long; the body has been dated to around 3,300 BC and another bow made from yew was found within some peat in Somerset, England dated to 2700–2600 BC. Forty longbows have been discovered in a peat bog at Nydam in Denmark which date from the 4th century AD. In the Middle Ages the Welsh and English were famous for their very powerful longbows, used en masse to great effect against the French in the Hundred Years' War, with notable success at the battles of Crécy (1346), Poitiers (1356), and Agincourt (1415). 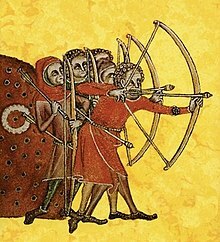 During the reign of Edward III of England, laws were passed allowing fletchers and bowyers to be impressed into the army and enjoining them to practice archery. The dominance of the longbow on the battlefield continued until the French began to use cannon to break the formations of English archers at the Battle of Formigny (1450) and the Battle of Castillon (1453). Their use continued in the Wars of the Roses however and they survived as a weapon of war in England well beyond the introduction of effective firearms. The average length of arrow shafts recovered from the 1545 sinking of the Mary Rose is 75 cm/30 in. In 1588, the militia was called out in anticipation of an invasion by the Spanish Armada and it included many archers in its ranks; the Kent militia for instance, had 1,662 archers out of 12,654 men mustered. The first book in English about longbow archery was Toxophilus by Roger Ascham, first published in London in 1545 and dedicated to King Henry VIII. Although firearms supplanted bows in warfare, wooden or fibreglass laminated longbows continue to be used by traditional archers and some tribal societies for recreation and hunting. A longbow has practical advantages compared to a modern recurve or compound bow; it is usually lighter, quicker to prepare for shooting, and shoots more quietly. However, other things being equal, the modern bow will shoot a faster arrow more accurately than the longbow. The Battle of Flodden (1513) was "a landmark in the history of archery, as the last battle on English soil to be fought with the longbow as the principal weapon..." The Battle of Tippermuir (1644), in Scotland, may have been the last battle involving the longbow in significant numbers. The last recorded use of the longbow in war was by British Lt. Col. Jack Churchill, who used it to kill a German soldier in World War II. Top: Lemonwood, purpleheart and hickory laminated bow. Because the longbow can be made from a single piece of wood, it can be crafted relatively easily and quickly. Amateur bowyers today can make a longbow in about ten to twenty hours, while highly skilled bowyers, such as those who produced medieval English longbows, can make wooden longbows in just a few hours. One of the simpler longbow designs is known as the self bow, by definition made from a single piece of wood. Traditional English longbows are self bows made from yew wood. The bowstave is cut from the radius of the tree so that sapwood (on the outside of the tree) becomes the back and forms about one third of the total thickness; the remaining two thirds or so is heartwood (50/50 is about the maximum sapwood/heartwood ratio generally used). Yew sapwood is good only in tension, while the heartwood is good in compression. However, compromises must be made when making a yew longbow, as it is difficult to find perfect unblemished yew. The demand for yew bowstaves was such that by the late 16th century mature yew trees were almost extinct in northern Europe. In other desirable woods such as Osage orange and mulberry the sapwood is almost useless and is normally removed entirely. Wooden laminated longbows can be made by gluing together two or more different pieces of wood. Usually this is done to take advantage of the inherent properties of different woods: some woods can better withstand compression while others are better at withstanding tension. 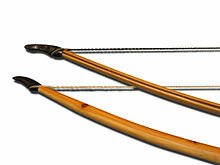 Examples include hickory and lemonwood, or bamboo and yew longbows: hickory or bamboo is used on the back of the bow (the part facing away from the archer when shooting) and so is in tension, while the belly (the part facing the archer when shooting) is made of lemonwood or yew and undergoes compression (see bending for a further explanation of stresses in a bending beam). Traditionally made Japanese yumi are also laminated longbows, made from strips of wood: the core of the bow is bamboo, the back and belly are bamboo or hardwood, and hardwood strips are laminated to the bow's sides to prevent twisting. Ready-made laminated longbows are available for purchase. Any wooden bow must have gentle treatment and be protected from excessive damp or dryness. Wooden bows may shoot as well as fiberglass, but they are more easily dented or broken by abuse. Bows made of modern materials can be left strung for longer than wood bows, which may take a large amount of set if not unstrung immediately after use. The Dakota Longbow T-76, a sniper rifle. ^ "The Efficacy of the Medieval Longbow: A Reply to Kelly DeVries," Archived 2016-01-23 at the Wayback Machine War in History 5, no. 2 (1998): 233-42; idem, "The Battle of Agincourt", The Hundred Years War (Part II): Different Vistas, ed. L. J. Andrew Villalon and Donald J. Kagay (Leiden: Brill, 2008): 37–132. ^ "The History of the English Longbow". historic-uk.com. Archived from the original on 12 June 2017. Retrieved 3 May 2018. ^ Carr, Simon (28 March 2014). "World War 2 hero 'Mad Jack' Churchill named one of world's greatest adventurers". The Daily Mail. Archived from the original on 9 May 2015. Wikimedia Commons has media related to Longbows. Look up longbow in Wiktionary, the free dictionary. The Traditional Bowyers Bible Volume 1. 1992. The Lyons Press. ISBN 1-58574-085-3. The Traditional Bowyers Bible Volume 2. 1992. The Lyons Press. ISBN 1-58574-086-1. The Traditional Bowyers Bible Volume 3. 1994. The Lyons Press. ISBN 1-58574-087-X. The Traditional Bowyers Bible Volume 4. 2008. The Lyons Press. ISBN 978-0-9645741-6-8. Bryant, Arthur (1963). The Age of Chivalry. Gray, David (2002). Bows of the World. The Lyons Press. ISBN 1-58574-478-6. The Great Warbow: From Hastings to the Mary Rose, by Dr. Matthew Strickland  and Robert Hardy, Pub Sutton, 2005, ISBN 0-7509-3167-1. Longbow: A Social and Military History, by Robert Hardy, CBE, FSA. Pub Sutton, rev 2006, ISBN 0-7509-4391-2.